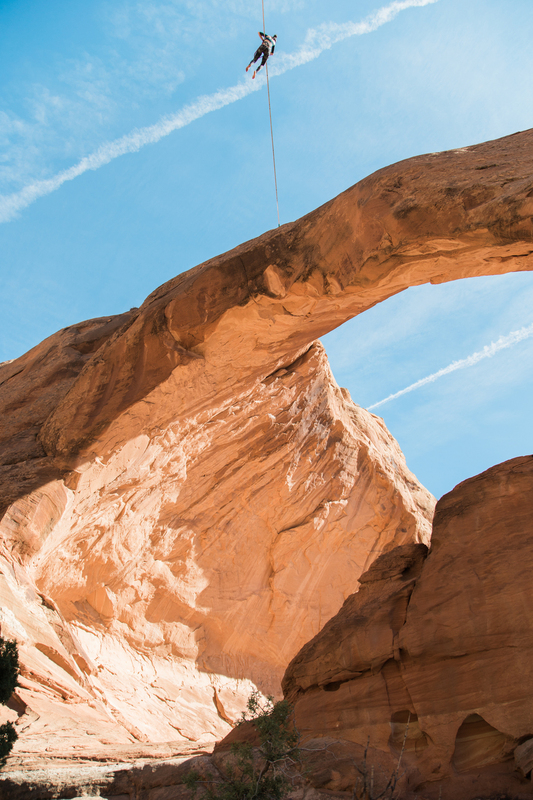 As promised in my last post about our recent trip to Moab, this post is fully dedicated to our favorite shoot to date! This was one of those days that felt like it could have lasted a lifetime. 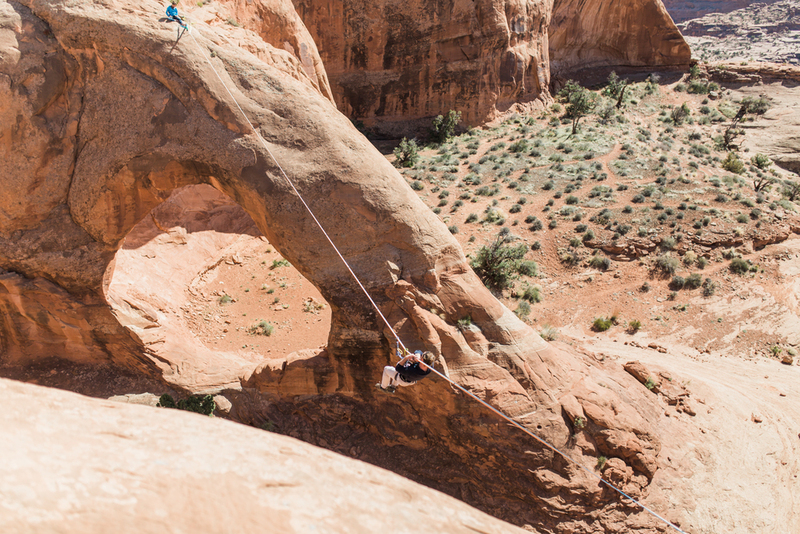 We originally connected with Sylvan and Michelle on instagram, and when we planned our most recent trip to Moab, Sylvan offered to show us one of the many beautiful highlines in the area! 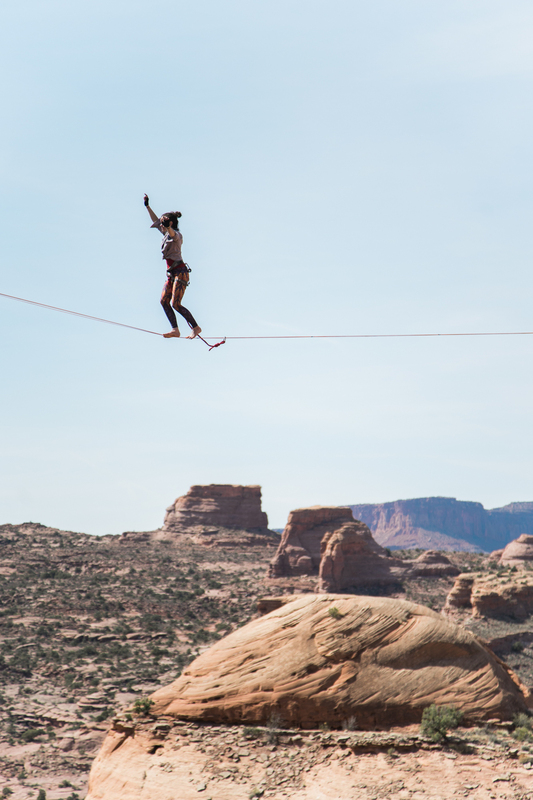 One of our big photography dreams is shooting fringe sports like slack lining and BASE jumping, so we were psyched for the opportunity to spend time with our new friends and get a feel for this realm of photography. We had so much fun with it, and let me tell you, this challenged me in ways that I didn't expect to be challenged when I first started shooting four years ago! I have been cursed with the "mom instinct" - you know, the one that causes your stomach to flip when people get near an edge, or the one that comes up with every bizarre worst case scenario, but once I started shooting, that worry (mostly) went away and was replaced with psyche. I kept looking over at Callen as he explored the sandstone mesa for different angles and new ways to shoot this gorgeous line, and I couldn't believe we were really doing it. The thing is, the lighting was far from perfect, we got a ticket for camping in the parking lot, and I spent most of the morning fighting a stomach ache (I even took a long nap on the rock). But, between shooting our friends as they did their art, and talking with them about everything from marriage to travel to pursuing dreams when they make no sense, this day left me inspired, exhausted and fulfilled.